Hi! I am For. Grace R. Cutab, an instructor at the Camiguin Polytechnic State College. I would like to ask for your help if you have contact details, preferably email address of For. Samuel V. Racho, OIC of Bohol Environment Management Office (BEMO). I will be submitting an internship proposal to him for our Agroforestry students here in Camiguin Island. Thank you very much for your help. That is the official email of Bohol Environment Management Office(BEMO). I personally appreciate your crime data being published in your PDDO website. It has been a helpful tool to us. We mostly appreciate the clustering for each cities and municipalities. Moreover, we are currently conducting a research concerning Ubay, Bohol. We would like to request for crime statistics of 2013-2014 and if you already have Q1 2015 it will be great. We are looking forward for your favorable response. Thank you for the compliment. As of the data for 2013 and 2014, our section in-charge said they have been asking for it from the PNP but they have not received the data yet. Probably because PNP changed their methodology in recording crimes that they might have difficulties in complying with our data requirement. 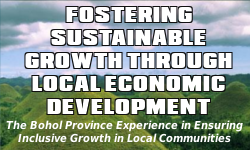 Please be informed that the PGBh-LGU(Loon)-Boheco-NEA collaborative project entitled “Lighting Up Cabilao Island through Public – Private Partnership” has been shortlisted for a Galing Pook Award for best practices in local governance. In this connection, a site validation and interaction with development partners will be conducted on June 18-19, 2015. We have sent communication to the Governor and, just in case if he cannot be present on June 18 (interaction with development partners), Mayor Lopez requests the attendance of the Provincial Planning and Development Coordinator. Could you please send me a PDF version the Province of Bohol Tourism Code or let me know who to contact in order to request it. My email is ….. The PPDO does not have a copy of the Bohol Tourism Code. You may refer your inquiries to the Bohol Tourism Office. However, if it helps your purpose, we have the Bohol Tourism Master Plan available for download. Hello. Good Day. I have read that the CLUP (2013-2022) for the municipality of Panglao has been approved (http://www.boholnewstoday.com/201412/cpg-towns-clup-no-yet-approved-sp-committee.html). I would like to ask if is it possible to request for a copy of the said CLUP? To whom should I make a request and could I ask for the contact details? Thank you so much. Though the Provincial Planning and Development Office has a copy of the approved CLUPs, it is the municipalities that disposes such documents. We welcome clients to come to refer to the documents we have, but we don’t allow them to be brought outside the office. You may contact the Municipality of Panglao through their website or through the contact numbers provided therewith, for inquiries in securing a copy of the said document. We hope this would be of help for your purpose and thank you for the comment. Good day! Currently, I am a post-graduate student from the School of Urban and Regional Planning in UP Diliman. My thesis is tentatively titled “The Role of an Intermodal Logistics Network in Disaster Response: A Case of Bohol Province, Philippines”. With regard to this, I would like to request from your good office shape files of hazard maps and the base maps. Your maps and data database are very impressive. If there is any way to reach your office, please let me know. My contact details are indicated below. Please rest assured that all data gathered will only be for educational purposes. I would be more than happy to provide your office of my final output. Hoping for your kind consideration. We’re sorry for the delay, we have to clear a few files from copyrights. For your request and for any succeeding requests for shapefiles, we are publishing the files here in our website for free download. Please find the Shapefiles sub-page of the Provincial Atlas at the PPDO-Bohol website. We hope you find the files useful for your endeavor, and for the betterment of the Province of Bohol and its people. Thank you for this information Sir Willy! I look forward to sharing the results of my research soon. Good evening! I am a post-graduate of BS Architecture in Don Honorio Ventura Technological State University in Bacolor, Pampanga. Along with my group mates, we are currently working on our thesis entitled “Bohol Heritage Village”. Last August 10-13,2015, we visited Baclayon in order to acquire the necessary documents we needed, but we failed to get the cadasral maps. i would like to request from your good office the cadastral maps of Bohol or Baclayon, whichever you can provide. Please know that whatever data that you will provide us will be used for educational purposes only. We are hoping for your kind consideration. We’re sorry we can’t provide cadastral maps. That you need to get from the Municipal Assessor’s Office. What we have are crude base maps for indicative purposes only. You may download Municipal Base Maps from the Map Gallegy Section of the Provincial Atlas tab. We are students from the University of San Carlos, School of Business and Economics – Graduate Studies. We are currently taking up Strategic Management this second trimester of academic year 2015-2016. As our course requirement, we are to study a specific industry and have an analysis as our final output. We have chosen the tourism industry of the City of Bohol. Bohol has always been one of the top tourism destinations in the country and has been a help to the whole country toward achieving economic growth. With this regard, we would like to ask the permission of your good office to have an interview with respective authorities in PPDO Bohol regarding the Strategic Management Plan for Bohol Tourism. Our schedule tour will be on October 15 to 18, 2015. Looking forward for a favorable response to our request. I have friends who owns a lot in Panglao Island and they plan to build a beach house. They requested me to ask and request from your end if you have any laws in terms of residential construction or any restriction that is required in building at Panglao Island or is it just the Philippine National Building Code. The lot has a beach front. Please do email if you have any. Please refer your concern to the Municipality of Panglao. You may visit the office of the Municipal Planning and Development Coordinator, and the Municipal Zoning Officer. Our firm, Dominic Galicia Architects, a Manila based architectural company, is currently developing a Conservation Master Plan for the St. Joseph the Worker Cathedral (Tagbilaran Cathedral) in Tagbilaran, Bohol, the initial stages of which includes extensive research and data gathering on the cathedral’s history as well as Tagbilaran’s history and other related literature that could pertain to History of Bohol. The project is headed by the Royal Catholic Diocese of Tagbilaran and funded by the Chito Madrigal Foundation and Defending Family Values Foundation Inc. In line with this, we would like to inquire if your office have the archive of the 1855 plan for the capitol of Tagbilaran signed by Col. Kirkpatrick. The plan would be helpful with regards to the chronological development of Tagbilaran, The historical basis of site planning and built-up of site context for the cathedral. If the data is available in your office please let me know how I can acquire the data from your office. We are looking forward to your favorable response. We are sorry to inform you that our Office do not have the archive of the 1855 plan of the capitol of Tagbilaran. May I refer you instead to the National/Bohol Museum or the National Historical Institute if such material is with them. We hope you can find the data you are looking in these agencies. Thank you for your response! We also hope to successfully find the data. Hi Maxine, this is as much we had acquired from the National Museum Bohol Branch, through its curator Mr. Charlemeine R. Tantingco. Two articles are also included whose authors are indicated on each article. Please acknowledge accordingly. You may CLICK HERE to download a zipped folder containing pictures and articles. We hope this would be of much help. May I ask for the contact details of PPDO of Bohol. Thank you. Hi Jo, thank you for the heads-up. We’ve updated the page to include our contact information. Happy new year.may i know mam sir who is our provincial engineer and how i can contact him/her through email or celphone number.i am gping to send proposal for uav drone.tnks. I would like to know the name and E-mail address of Provincial Planning and Development Officer of the Province of Bohol.